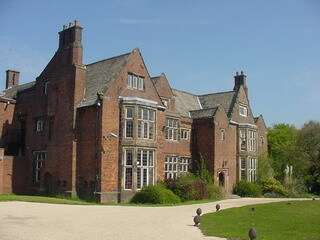 Heskin Hall is one of the best examples of Tudor Architecture in Northern England. Construction started on this, the New Hall, in C. 1548, and the Hearth Tax records of 1666 record it as the largest property upon the manor, with 15 hearths. The earliest records for the area (1212) describe Eccleston and Heskin as one "Knights Fee" held by Roger Garnet. Interestingly, its history since then includes reference to some of the most famous names of English history. In 1506 these lands, together with others, where sold to Edmund Dudley, Minister of Henry VII (later executed for treason) Although initially forfeit the lands did pass to his son, John Dudley, Duke of Northumberland, in 1511 In 1556 the manor was bought by a local nobleman,Richard Molyneux.. At the same time he purchased the reversion to it and other lands from Mary, the widow of Sir Thomas Seymour, father of Jane Seymour (wife of Henry VIII). It remained in the hands of the Molyneux family until 1739 when it became part of the Mawdsley Estates until sold to Alexander Kershaw in 1744. A wealthy man who originally came from Rochdale, he seems to have led something less than a moral lifestyle. He never married but when he died in 1788 he left three acknowledged children, Edmund Newman Kershaw, John Copper and James Kershaw. By a will dated 1786, Edmund inherited the estate of his father but on his death, without legitimate children, it passed to his brother John. His death in 1833, again without legitimate children, left the estate the subject of a legal dispute. It was the heirs of Mary Kershaw (Scott) who emerged victorious from court. The main issue of the case seems to have been who was the legally, legitimate, heir. She was the sister of Alexander Kershaw and seems to have shared some of his character. It is said that on her wedding day, at the church door, she "escaped", riding pillion on the horse of her lover, Ralph Scott. She lived with him from 1713 until her death in 1769. Although there was no official parish record of their wedding, witness testimony was accepted by the Court that they had been universally accepted as man and wife, hence her heirs could inherit. The last people to occupy the hall as a home where Lord and Lady Lilford in the 1960' s. She was an ex-dancer and actress and on their divorce in 1969 the Hall and the surrounding 8 acres went to her as part of the divorce settlement. Since then occupation has been commercial, including Blackburn College and a double glazing firm, who both used it for training and educational purposes. As with most houses of any age however the most talked about inhabitants are its ghosts. A young girl and an older man, they are said to date from the Civil War which saw the Hall as a centre for much activity. It was allegedly an overnight resting place for Oliver Cromwell as well as being a site for the hanging of religious martyrs. Certainly the then owner, John Molyneux, declared for Parliament, but this was only after the fall of Lathom House (a Lancashire Royalist stronghold) and it could be this, his somewhat late declaration, that led to the Compounding of the estate. As to the ghosts themselves, they are alleged to be those of a young roman Catholic girl who was hanged by a Priest as evidence of his conversion to Protestantism. Cromwells' soldiers where not convinced and hung him from the same spot. Whatever the truth of it Lady Lilford is on record describing the haste of some of her guests to depart, as a result of sitings during their stay, and it is well known that the Civil War in Lancashire saw many atrocities. It was perhaps the bloodiest in the country. Now in use to house various stalls containing memorabilia and collectables. Open to the public. Restaurant.